Powers/Abilities: The Cat Burglar possessed no superhuman powers but was a skilled thief and occasionally carried a handgun for protection. 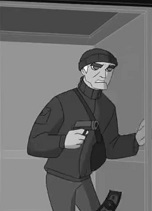 History: (The Spectacular Spider-Man cartoon episode - "Opening Night" (fb) - BTS) - Having established himself as a skilled thief for years, Walter Hardy, the Cat Burglar, took pride in never hurting anyone during his crimes and chose to never carry a gun. As he got older, however, he got slower and more afraid, and began carrying a gun for protection. (The Spectacular Spider-Man cartoon episode - "Intervention" (fb)) - Following a wrestling match in which the newly-powered Spider-Man publicly defeated wrestler "Crusher" Hogan, the Cat Burglar held up promoter Sullivan Edwards and stole the match's prize money. Angry that Edwards had earlier refused to give him the prize money unless he signed an exclusive contract to wrestle for Edward, Spider-Man allowed the Cat Burglar to run past him and catch an elevator. As the elevator door closed, the Cat Burglar smiled at Spider-Man and Edwards angrily glared at Spider-Man, who remarked that it wasn't his problem. When Peter Parker later returned home, he learned that his uncle Ben had been killed by a burglar and, soon tracking the burglar down as Spider-Man, Parker forced the burglar to crash his car. The burglar quickly fled into a nearby warehouse, where an emotional Spider-Man held him out of a window as police watched outside. When the light hit the Cat Burglar's face, the horrified Spider-Man realized that the Cat Burglar, whom had earlier let escape, had killed his uncle Ben. Spider-Man announced to the Cat Burglar that he should drop the burglar, taking his life the way he had taken Uncle Ben's, and Spider-Man terrified the Cat Burglar by dropping him. Thinking about what his uncle had told him earlier that day about how with great power came great responsibility, Spider-Man caught the Cat Burglar's leg with a web to save his life. More police soon arrived to witness the Cat Burglar hanging from the window on a web. (The Spectacular Spider-Man cartoon episode - "Intervention" - BTS) - While trying to fight off bonding with an alien symbiote, Spider-Man thought back to his origin and the lesson he learned about responsibility when he allowed the Cat Burglar to escape. (The Spectacular Spider-Man cartoon episode - "Opening Night" (fb) - BTS) - The Cat Burglar was sent to Ryker's Island prison. 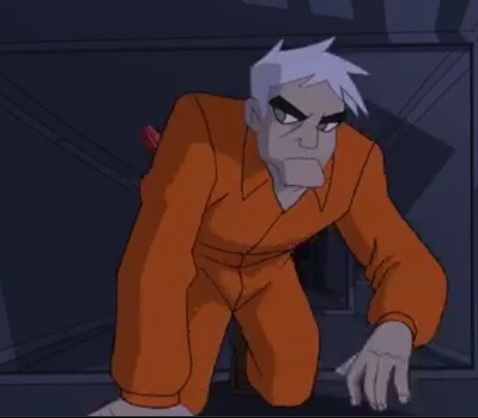 (The Spectacular Spider-Man cartoon episode - "Opening Night") - The Cat Burglar's daughter, Felicia, better known as the Black Cat, broke into Ryker's Island prison in an effort to free her father. The Cat Burglar scolded Black Cat for risking her own freedom for his and remarked that she couldn't have picked a worse time, as the prisoners had just been freed from their cells by the Green Goblin to battle Spider-Man, who was in the prison to test its new Vault wing. Remaining in his cell during the breakout, the Cat Burglar watched as Black Cat intervened in the freed criminals' fight against Spider-Man, aiding the webslinger. Eventually, Spider-Man and Black Cat fled into the Cat Burglar's cell and Spider-Man, unaware of who was in the cell, webbed the door shut. As Black Cat and Spider-Man caught up while in the cell, Black Cat admitted she was at Ryker's Island to break out her father, Walter Hardy. When Black Cat introduced Walter as the Cat Burglar, Spider-Man immediately recognized the face of the man that had murdered his uncle. The freed super-villains soon breached the cell, only to find that Spider-Man, Black Cat and the Cat Burglar had escaped via a hole in the ceiling. As the trio made their way through the prisoner air ducts, Spider-Man announced that there was no way he was going to allow Black Cat to break the Cat Burglar out of prison. Black Cat then mentioned that she had hoped that if she helped Spider-Man contain the breakout that he would look the other way for the Cat Burglar to escape but Spider-Man sternly asked if she knew what happened the last time he looked the other way for Walter. 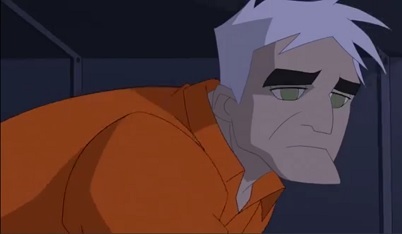 A nervous Walter then followed Spider-Man and the Black Cat into the Vault area of the prison, where tanks full of tranquilizer gas was held. Realizing that the gas had to manually released by someone sealed within the Vault area, Walter volunteered to release the gas himself, admitting that he had made a huge mistake the night he entered Ben Parker's life. Hearing Spider-Man's exclamation that Walter's sacrifice would not make them even and that he was not forgiven for murdering Ben, Walter remarked that he understood and still agreed to release the gas and stop the villains. Moments later, after working out the plan, Spider-Man led the escaped super villains into the Vault area, where the Cat Burglar was waiting for them. Sealed inside with the villains, Walter manually opened the tanks of tranquilizer gas as Black Cat escaped. Thinking that he needed to stay in prison to atone for his crimes, Walter was soon affected by the gas and he passed out over the manual release valve. Black Cat then returned to aid Spider-Man in forcing the Green Goblin to retreat but as she departed, she blamed Spider-Man for leaving Walter to rot in prison and promised she would never forget that. Comments: Created by Greg Weisman, Kevin Hopps, Randy Jandt and Hanho Heung-Up Co., Ltd. (see Appearances list for full list of artists involved). The Cat Burglar was a mix of a few different Earth-616 characters, including the Burglar (who killed Uncle Ben), the Cat Burglar (a thief Spider-Man fought during the 60s) and Walter Hardy, the Black Cat's father. The Cat Burglar was first only seen in a flashback to Spider-Man's origin when the alien symbiote captured and forced Peter Parker to relive some of his past. He eventually appeared fully in his second episode, "Opening Night." The Cat Burglar's physical height and weight are presumed to be the same as his Earth-616 counterpart, the Burglar. The Cat Burglar/Walter Hardy was voiced by James Remar.